Story: Raja is a jovial, happy going person who breaks up with his girl friends all the time, in the process he falls in love with another girl. Later on, movie takes on to turns and twists till the end. Review: First Sharwanand came out of his serious roles to fit into the role of a boy-next-door. Undoubtedly he is a very talented artist in tollywood. He put his heart and soul in the character to present well on the big screen with ease and proved his mettle. Heroine was okay by looks but she had done great job in acting and dance movements especially in "Vadhantune.." song. Others had done their part well. Sampath Raj was impressive. Director Sujeeth should be appreciated for his screenplay and successful in presenting the story as the way he wants. The taking of the scenes were good, opening scene was striking. Though there were few shades of KICK movie in screenplay but different. 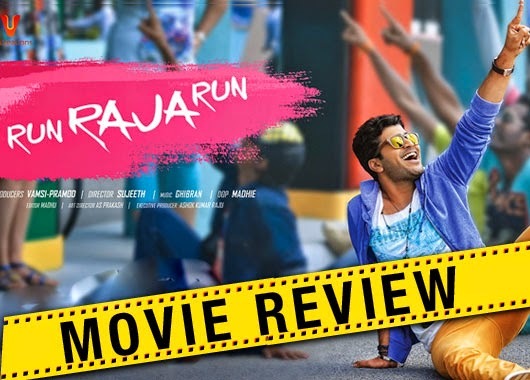 Overall, Run Raja Run is a complete entertainer with laughs, twists, turns. Music Dept: Songs by Ghibran were refreshing and would stand as best in chart-busters. Background score was also good. - Points: Emotional scene was not up to the mark. Interesting points: Ghibran's first movie in telugu. Suggestion: A good watch. Give a shot. Bottomline: A playful entertainer. Run for this movie.